Next year, the first state-owned search engine on the Internet may appear in Russia. So far, officials are refusing to comment on whether the government is involved in such a development project or not. No business model has been revealed yet, but Russian media has already leaked the hypothesis that the basic focus of the new search engine will be on legal content. The new search engine in Russia will be named Sputnik — the most familiar Russian word all over the world, known since the start of space exploration and symbolizing high technology. Applications were submitted to Rospatent for registration of the trademark Sputnik Rostelecom by the State Telecommunications Corporation Rostelecom and its affiliated company KM Media, which will be the direct developer of this service. It is assumed that this new search engine will be launched sometime next year and that it will not follow the advertising model of doing business. Russian authorities have been toying with the idea of ​​creating a national search engine based on government needs since 2010. The initiator of this project was supposedly one of the most influential Russian officials, the former deputy head of the presidential administration, Vladislav Surkov, who, after a brief hiatus, recently returned to the Kremlin as presidential assistant. Active development of the project involving the creation of a national search engine has been in the works for the last two years, says Timur Nigmatullin, analyst at Investkafe. During this time, the state company has invested approximately $20 million in the project; toward the New Year, Runet should be fully indexed, according to Nigmatullin. So far, it is not clear whether the new search engine will receive a monopoly on the provision of search services in the public sector. Moving citizens to electronic forms of relationships with government officials began relatively recently, and not everyone knows how to use these services — for example, the payment of fines or the filing for foreign passports online. 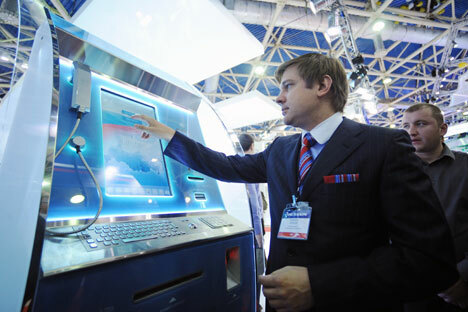 In addition, Rostelecom itself is expecting to undergo privatization scheduled for 2014–2016. Although the Russian government has slowed down ownership transfers into private hands in recent years, Nigmatullin doubts that the government would entrust a private company with a monopoly on Internet surfing in the public sector. “Maybe Rostelecom is simply involved in developing this project, which later will be transferred into the ownership of the state,” the analyst said. Representatives of Rostelecom refused to answer questions from RBTH, saying that they had no comments on the matter. The business model on which the financial health of the new search engine will be built also remains unknown. According to Digit.ru, one of the lines of business will be sales of legal content. Vladimir Gabrielyan, vice president and technical director at Mail.Ru Group, told RBTH that he does not believe the new search engine Sputnik will be successful. “Search engines are very technology-intensive, and Rostelecom has never had much experience in creating web projects. Besides this, it is very hard to promote such a product. To launch a quality search engine from scratch is an extremely difficult task,” said Gabrielyan. Joking that the emergence of a new search engine is positive thing from the point of view of the labor market for specialists in the field of search technology, he stressed that the idea of ​​creating a secure search engine with filters protecting children from inappropriate content is not a particularly strong selling point. “This is not something that will make the search engine popular, because, besides the fact that the content will be well-filtered, above all else, it is the delivered content that is important, so the search results must be of high quality. In any case, it seems to me that, for us at Mail.Ru and, for example, at the Yandex Company, it would be much easier to add a filter for children than for someone to make a search engine from scratch, based on this one functionality,” Gabrielyan said. “If [the search engine] will be seriously promoted, maybe it has a chance to enter the top three or top five in the country. However, we must understand that a modern search engine is not just a site where you go looking for a trip to Turkey or to download some report. A modern search engine is an ecosystem: It is traffic reports, as in the case of Yandex; it is mail, it is hard drives for data storage, as is the case with Yandex and Google, and so on. Therefore, this is not just a search function, but also a large serious infrastructural development, which takes years to accomplish. This cannot be done in six months; it cannot be done in 12 months. It is not as easy as snapping your fingers,” said Terekhov. The expert explained that the only reason he sees for the creation of a state-owned search engine is the Russian government’s persistent belief that everything has to be run by the government — mail delivery by the Russian Post and telephone services by Rostelecom are all state-owned. “Apparently, according to the same logic, there should be state-owned search engine, even though it is just a website and simply an online business,” Terekhov said. According to Liveinternet, by the number of visitors coming from search engines, the largest in Russia is Yandex, with 61.8 percent based on a seven-day average (as of October 18, 2013). It leads by a large margin the next most popular search engines — Google (26.9 percent), Search.Mail.ru (8.3 percent), Rambler (1.2 percent) and Bing (0.6 percent).